What’s it like to live and work as an artist in communist China? In spite of home arrests and living under constant surveillance by the Chinese regime, internationally renowned artist Ai Weiwei continues to prepare for his exhibitions in museums and cultural centers throughout the world. 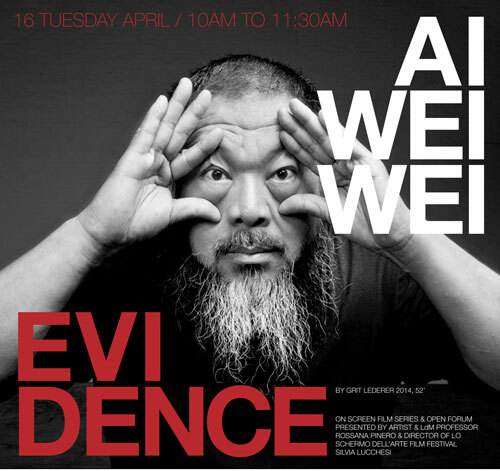 As an artist Weiwei is active in sculpture, installation, architecture, photography, film, and social, political and cultural projects. As a political activist, he has been highly and openly critical of his country’s government stance on democracy and human rights. His Spring 2014 SOLO exhibition at the Martin-Gropius Bau Museum in Berlin coincided with the release of the documentary “Evidence”, featured during a special screening this Thursday, April 16 at LdM in Florence. For this documentary, film director Grit Lederer follows Gereon Sievernich, director of the Gropius Museum in Berlin, on his travels to China to meet with Weiwei. Along with relevant aspects of his artistic practice, the camera follows their conversations regarding the selection of works that will be part of the exhibition. Special focus is given to “Stools”, an installation made for the atrium of the museum with over 6,000 wooden stools that have been commonly and historically used in the Chinese countryside. The screening will be presented by the director of the Lo Schermo dell’Arte Film Festival Silvia Lucchesi, and LdM Fine Arts Prof. Rossana Pinero. Pinero’s career as an artist took off with investigations in film photography, painting and drawing, while in recent years she is increasingly drawn to fiber and textile works that have led her works into mixed media installations.